At the end of July 2013, foreign holders of U.S. Treasury securities totaled close to $5.6 trillion. 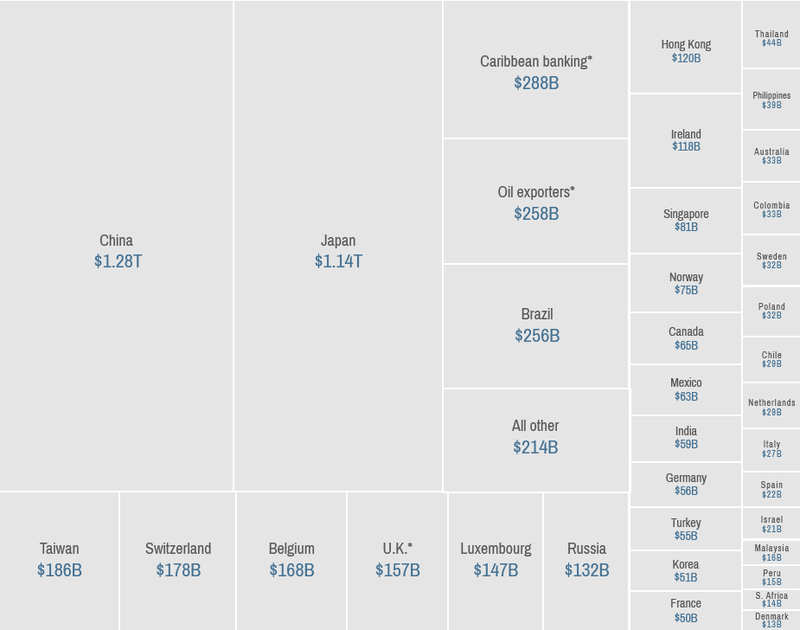 Estimated foreign holdings of U.S. Treasury marketable and non-marketable bills, bonds, and notes reported monthly under the Treasury International Capital (TIC) reporting system. Holdings of Treasury bonds and notes are reported on TIC Fom SLT, "Aggregate Holdings of Long-Term Securities by U.S. and Foreign Residents," including preliminary SLT data for the most recent month. The data in this table are collected primarily from U.S.-based custodians. Since U.S. securities held in overseas custody accounts may not be attributed to the actual owners, the data may not provide a precise accounting of individual country ownership of Treasury securities. *United Kingdom includes Channel Islands and Isle of Man. *Oil exporters include Ecuador, Venezuela, Indonesia, Bahrain, Iran, Iraq, Kuwait, Oman, Qatar, Saudi Arabia, the United Arab Emirates, Algeria, Gabon, Libya, and Nigeria. *Caribbean Banking Centers include Bahamas, Bermuda, British Virgin Islands, Cayman Islands, Netherlands Antilles and Panama. China and Japan to U.S.: Don't default! Washington's march toward a self-inflicted financial calamity is setting off alarm bells in capital cities around the world. The law that caps federal borrowing must be raised asap. Here's what happens if it's not. There's no precedent for a willful U.S. default on its legal obligations. So predicting the fallout is dicey. But many economists and budget experts expect it to be very damaging for the economy and markets.